As we come into the week before the Melbourne Cup, don’t fall for the glitz and the glamour of the racing industry. These horses are the real story of Australian horse racing … and most people would never have known about them. In the month of October, when Spring Racing Carnival is already in full swing, 9 horses have been killed on Australian racetracks. Their deaths are traumatic – but they are only a drop in the ocean for an industry that has no retirement plan for its horses. Ever since the release of our annual Racehorse Deathwatch report, Victorian racing stewards have no longer disclosed causes of deaths of racehorses, simply listing them as ‘serious racing injuries’. While we don’t know what caused Rock With You’s death on the track, we do know some of the most common serious injuries sustained by Australian racehorses are catastrophic front and hind limb injuries (ie broken and fractured legs), massive bleeds and cardiac arrests. While the average horse lifespan is between 25 and 30 years, Knievel only made it to 3. The young bay gelding began his racing ‘career’ as a 2-year-old, predisposing himself to injury before his young and underdeveloped joints were fully formed. He died of a compound fracture of the cannon bone. Hamada was tipped to be a star – set to run in the Melbourne Cup in November. But while training on the track for the big race, he ‘broke down’ in the near hind leg. His stablemate ‘Emotionless’ was also pulled after fracturing his pelvis. Blinkin Impressive is a typical example of a horse who dies on the track that nobody ever hears about. She’d won just $1,300 – which like most, does not even cover the costs of having a racehorse. While racing in October, she suffered a carpal joint fracture of the near fore leg. Following the death of 2 Australian racehorses just the day before, Deny also became a victim of October horse racing. He fractured his near fore knee while racing. Just 3 days before thousands of people flocked to Caulfield Racecourse for the Caulfield Cup, Gustavas Vassa became the victim of a ‘serious racing injury’ on the very same track and was killed. Racegoers and supporters of the Caulfield Cup had no idea. Not For Export had won $168,335 for his owners and connections. He suffered a compound fracture to the off fore cannon bone while racing on a remote Australian racetrack and was killed. October isn’t any sort of one-off or month of ‘freak accidents’ like the racing industry would have you believe. 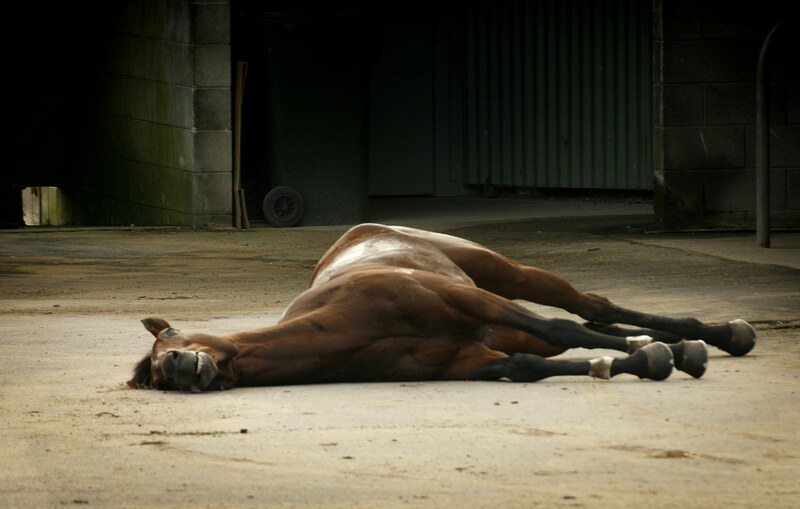 Consistently, one Australian racehorse has died on the track every 3 days, or less, for the past 4 years. If you’re thinking of attending the races, or even placing a bet, think of these horses. And choose kindness instead. In Australia there are dozens of knackeries that process failed and former racehorses for pet food, as well as two abattoirs that kill horses for human consumption in South Australia and Queensland. Some of their ‘horse steaks’ are served in a select few Melbourne restaurants, but the majority are exported to European countries like Belgium and France. Unless you live ~under a rock~ you will have heard about the four Melbourne Cup deaths in recent years. The industry would have you believe these are ‘freak accidents’ and ‘rarely occur’, right? Wrong. One racehorse dies every 3 days in Australia. And 119 racehorses have died in the last racing year alone. They most commonly suffer catastrophic limb injuries, cardiac arrests and massive bleeds causing them to collapse and die. We compile them all in our deathwatch report, which you can read here. Whipping = one of the most public displays of animal cruelty. The cobalt saga involving numerous high profile trainers is just one example of using stimulants to push horses beyond their physical capabilities. If you think the race that stops the nation is no cause for celebration, you’re not alone! Here are 4 really awesome ways you can help racehorses on Melbourne Cup Day and throughout Spring Carnival. There are sanctuaries across the country who are constantly cleaning up the mess of the racing industry by rescuing failed & former racehorses. But maintaining and looking after them isn’t an easy task, and those caring for them can always use a helping hand. Make a commitment to volunteer with your local horse rescue or animal sanctuary instead of watching the races on Melbourne Cup Day! This one is a sure bet. Instead of putting money on the big race, why not commit to donate what you’d spend to an animal welfare group or sanctuary? Your money could go towards anything you choose – from long term campaigns for a racehorse retirement plan, to feed and vet care for an ex-racehorse at a sanctuary. You can’t lose out when you’re putting your money on a kinder world for racehorses! Find an event near you here. The only way that we will change the way horses are being treated in the racing industry is by raising awareness and keeping up the pressure! If there’s a protest in your area, head on down to show your support. You can find a list of our own protests on our Facebook events page. If you’d like to hold a protest, contact us, and we’d be more than happy to support. You can also download banners and posters on our resources page. The good news is, you don’t even have to leave your house to help racehorses! Check out our Facebook page and website for some really good information to share with your family friends online … and you can even add our ‘Nup to the Cup’ frame to your profile picture! If you’ve ever wondered if the efforts of animal protection advocates was having any impact, this definitely proves it. And this year, it reached the lowest since 1999. Melbourne Cup Day itself hit the lowest attendance in 20 years. This decline in attendance sits at around 25% since 2006. But you’ll probably work out that it’s no coincidence, since animal protection campaigns targeting the Melbourne Cup commenced just 2 years later in 2008. Since then, the racing industry has been routinely exposed for it’s welfare issues: the lack of retirement plan, jumps racing, public floggings with the whip, deaths on track and in slaughterhouses. Not to mention that horses have been consistently dying in the Melbourne Cup over the past few years, exposing a shocking statistic that this actually happens every 2.6 days year-round on Australian racetracks. This year a horse died at the Melbourne Cup and then the next day, a jockey publicly punched his horse and was only suspended for 2 weeks. And this is an industry that claims to care about horse welfare. It’s no wonder that the once-supporting-public can no longer take them seriously and are turning away in droves. An industry that once operated without being held to public account, now struggles to maintain its social license. And it will only get worse until they realise they need to do better — much better. Almoonqith was a 7-year-old gelding, who started his racing career as 2-year-old in America. After being brought to Australia, he ran a very successful racing career, making almost $1million in prize money. However, on 8 April 2017, Almoonqith broke his off-hind cannon bone while running in the prestigious Sydney Cup, and was killed right there on the track. Harmonic Lass was a 2-year-old filly running in the Wellington Boot. It was just her third time on a racetrack. During the race, she fractured her near fore fetlock and was killed. Unlike more prestigious racehorses, her death was not spoken about as she had only made around $4,000. Her story highlights a huge welfare concern in the Australian racing industry – racing horses at just 2 years old. Putting young, underdeveloped racehorses on the racetrack is absolutely culpable. And if they do not suffer catastrophic injuries at a young age, it still pre-disposes them to cumulative injury further on down the track. Finke was a 5-year-old gelding who had been racing since 2 years old. After a relatively successful racing career, making over $300,000 in prize money, his life abruptly ended at Morphettville on 25 Feb 2017. Finke pulled up from his race distressed, and collapsed in the mounting yard. A necropsy found that he had ruptured his aorta – suffering a massive internal bleed. The annual Oakbank Carnival is renowned for it’s cruel jumps races – which regularly result in the deaths of horses. This year was no exception – with Wheeler Fortune falling over the final hurdle right in front of a crowd of racegoers, including young children. A photo of him standing with a dangling front leg injury (which was reported to be a break to his near fore cannon bone) shaped the image of the rest of the Easter Carnival, and once again renewed calls for the ‘sport’, which is 20 times more dangerous than flat racing, to be banned. Wheeler Fortune had race as a 2-year-old, and was brought to Australia from New Zealand. If I’m Captain Oats had have died in any state but New South Wales, we would have never known about his death. The 2-year-old colt died while in trackwork on Hawkesbury racetrack, suffering a comminuted fracture to his off fore metacarpus (a catastrophic front limb injury). New South Wales is the only state in the country that reports deaths in training and trackwork in their stewards reports. If I’m Captain Oats had have been training anywhere else, his fate would not be public knowledge. Presumably, this is the case for many other racehorses dying outside of official races in every other state. Surface To Air had never run in a jumps race before, and his first try was his last. The 5-year-old gelding commenced his racing career in New Zealand, and after coming to Australia for a short stint in flat racing, he was moved into a jumps career. However, during his first ever jumps race at Murray Bridge, he fractured his fetlock and was killed on the track. His death highlights a combination that can never be made safe – jumping and racing. These horses are just 5 of 137 racehorses who have died on Australian racetracks since the 2016 Melbourne Cup. And they are five good reasons to never place a bet again. Since our inception in 2008, the Coalition for the Protection of Racehorses has continued to campaign for a better life for all racehorses. Always at the forefront of our concerns has been the slaughter of thousands of failed and former racehorses when no longer profitable. Before animal welfare campaigners like us began exploring the issues within horse racing – the industry was accountable to nobody. Welfare initiatives – if any – were few and far between, and their dark secrets were hidden under a veil of secrecy to the public. In 2012, we exposed the routine slaughter of ex-racehorses at a Melbourne knackery. And since then, we’ve continued to release investigations at saleyards, knackery holding yards and slaughterhouses – where the glitz and the glamour has been left far behind them. It’s a side of horse racing that the public had never seen before. Since then, programs like “Off The Track” that promote the thoroughbred after racing have continued to pop up, and while an important and worthwhile initiative, they fail to address the problem at large. Sound familiar? This is something we’ve been pushing for nationally through our 1% to stop the slaughter proposal. A huge issue facing ex-racehorses is the lack of homes or properties for them to be ‘let down’ before being rehomed. And even if this helps just a few of them, it’s a great start. It’s yet to be ratified by the board, and we’re still waiting on details about whether they will ensure horses aren’t just simply sent interstate for slaughter, or temporarily rehomed before going to an abattoir. But it’s a promising concept. Pretty. Damn. Cool. Now for the rest of the country! The racing year ends on July 31 every year, and starts again on August 1, also known as the ‘Horses’ Birthday’. The racing industry deems it a time of celebration – but is it? 4 years ago, the Coalition for the Protection of Racehorses began researching the number of racehorses that died on Australian racetracks every year. We knew there was a lot, we would read about them in the media, receive messages to our Facebook page from the public and concerned participants – and we even saw horses continue to die in the Melbourne Cup. But we never expected so many. Since the commencement of our annual ‘Deathwatch Report’ – horses have continued to die at alarming rates. And this year, it’s no different. In fact, it’s the worst year on record. From the racing year of 1 August 2016 until 31 July 2017, a shocking 137 racehorses died on Australian racetracks. That’s one racehorse every 2.6 days. 75 of these racehorses died of catastrophic limb injuries – breaks, tears and fractures of their forelegs. But horses also died of hind leg injuries, cardiac arrests, massive bleeds — even head trauma. Almost half of them had raced as 2-year-olds; pre-disposing them to long term cumulative injury further on down the track if they didn’t die young. The shocking full report is available to download and read here. But these deaths are just the tip of the iceberg – many thousands more are killed when they finish their racing ‘careers’ and no longer profitable. These horses are known as wastage. As more and more information about the ugly side of the racing industry coming to light, it’s no wonder that there’s a growing number of people choosing not to support horse racing cruelty. So with the Spring Racing Carnival fast approaching, remember that making kind choices can change the world for racehorses. In a world first, Harness Racing Australia has announced they will ban the whip in racing and even training from September 2017 onwards. It’s incredible news – and now it’s time for Racing Australia to follow and ban the whip in thoroughbred racing. Here’s why. Horses can feel a fly when it lands on their sensitive skin, so of course they can also feel the repetitive pelting of a whip. And in 2016, science proved that when a Catalyst program found that whips hurt racehorses. The. Rules. Don’t. Do. Anything. Racing proponents will be quick to interject “but we have RULES to prevent over-whipping in horse racing”. But the penalty is far too small for jockeys to be truly deterred from belting their horses across the finish line, with many owners publicly stating that they will pay their jockeys whipping fines because they want their horse ridden out. In fact, on Melbourne Cup Day in 2016, there was over 7 whipping fines and reprimands at the one race meet alone. And two weeks before that, one jockey pled guilty to intentionally striking his horse over the head in a race. Not once – but twice. Under animal welfare legislation, it is an offence to whip an animal. But the racing industry is exempt from these rules. And its time that changed. A Herald Sun poll conducted on the December 11 following the harness racing whip ban found that 79% of voters want to see a ban on the whip in all horse racing. Horse racing operates on a social license, and recent years have shown that more and more people will no longer tolerate animal cruelty. The racing industry is their own worst enemy if they don’t ban this most public display of animal cruelty. VICTORY: Whips to be banned in harness racing! Whips hurt racehorses. There’s no doubt about it. And science even proves it. Now, in a world-first, Harness Racing Australia has voluntarily decided to phase out and ban the whip. Not just in races – but on training tracks and stables, too. Too right! And that’s what happens when we stand up & speak out about cruelty to animals. Now it’s time for the thoroughbred racing industry to do the right thing by its horses and follow. You can read our proposal for the phase out of the whip here. If you think the race that stops the nation is no cause for celebration, here are 3 really awesome ways you can help racehorses on Melbourne Cup Day. Make a commitment to volunteer with your local horse rescue or animal sanctuary instead of watching the racing on Melbourne Cup Day! You can’t lose out when you’re putting your money on a kinder world for racehorses! If there’s a protest in your area, head on down to show your support.